01/19/14: Rumors are heating back up with the upcoming US tour. Someone over on a Springsteen fan forum wrote that they heard pretty much the rumors we posted below, that there will be shows in April and then a summer tour. This person also wrote that more festivals will happen outside of New Orleans' Jazz Fest. I haven't heard anything about cities but I can say that my personal source confirmed to me that quite a few shows were just booked not too long ago. There could still be a few more that need finalization but we are for sure getting closer to an announcement. 01/17/14: It appears that Springsteen is in the final stages of negotiations to play at the Quebec City Summer Festival this upcoming July. Source. 01/13/14: Meet Bruce and the band in Atlantic City on August 8 at the Boardwalk Hall. Well, at least to the latest rumor. It is rumored that Bruce and E Street will play Atlantic City, NJ at the Boardwalk Hall on August 8. We may know more tomorrow, but we will probably just get some spring dates. Either way, be sure to check back tomorrow for the latest tour news and dates and it looks like they are planning the summer tour as we speak! 01/09/14: Add some California dates to that Spring tour rumor mill! Got word that Los Angeles and San Jose are now possibilities for the upcoming spring US tour. Again, we should know the entire US tour on January 14! 01/08/14: January 14th will be a very busy day for Springsteen fans. High Hopes will be released and Springsteen may appear on Jimmy Fallon's show. Also, US fans will get good news about a Spring tour, plans can always change but it looks like that is the day US fans have been waiting for. So check back often for last minute news and rumors! 01/06/14: Add some new possible cities to that spring US tour. Heard today that the band will play the JazzFest in New Orleans and also heard Albany, NY. Expect an announcement soon with all of these cities pouring in. Cities mentioned so far: Chicago IL, Miami/Fort Lauderdale FL, Hartford CT, Newark NJ, Brooklyn NY, New Orleans LA (JazzFest), Albany NY, and Dallas TX. UPDATE (4:28 PM): Some more cities of possibilities: Richmond VA, Greensboro NC, Charlotte NC, Greenville SC. 01/06/14: A German radio station apparently talked about Springsteen doing some shows in Germany in late 2014. This very well could be the case as Springsteen will be doing a US tour in the Spring and Summer and then may go over to do some shows in Europe. 01/03/14: A new rumor that Springsteen will announce 8-10 US dates in April, right before South Africa. Cities may include: Chicago, Miami, Fort Lauderdale, Hartford, Newark, and Brooklyn. Then a summer tour starting around July with outdoor stadiums. Stay tuned for the latest as things are for sure heating up!! UPDATE: Personal source now tells me it is 100% confirmed that Bruce and E Street will tour U.S. starting in April. 01/01/14: What a great way to start off the rumors for 2014! A new rumor surfaces today in which the Huffington post over in Italy claimed that Bruce Springsteen will be making an appearance over in Italy sometime in 2014. They ranked the top 10 bands to see in 2014 and Bruce was in that group. No tour dates were listed. Most rumors have pointed to no European tour but things can change quickly. Click here to see the source. 12/30/13: Someone on Twitter (@CasinoNancy) has stated that she has been told of a possible new Springsteen album may be released in May or June. 12/13/13: A new Canada rumor has surfaced for yet another festival rumor for the summer of 2014. The rumor was posted on BTX as someone stated that they heard Bruce may play the Salmon Festival in Grand Falls-Windsor, Newfoundland next summer. They pointed out that big name bands have played the festival before in the past such as The Eagles, Kiss, Aerosmith, etc. Hopefully the tour rumor mill keeps churning, things have been very quiet since High Hopes announcement. 11/25/13: Welp, so much for that rumor below that lasted all of about 10-15 minutes. Well at least according to Swedish LiveNation. They said today that there will be no European tour next year for High Hopes. 11/25/13: Now that the album is official, there is a new rumor that has surfaced claiming that the band will tour Europe starting in March. I would take this one with a grain of salt unless Bruce is willing to leave behind Little Steve as Steve said he is filming his show Lillehammer through June after the South Africa, Australia, and New Zealand tour. 11/24/13: A dutch site has rumored that Bruce will announce his new album tomorrow alongside 2014 European tour dates. Check back tomorrow morning, announcement will most likely be made officially at 10AM. 11/23/13: Someone apparently got the new Springsteen album track listing, well at least the songs. The person, who posted the list on BTX, states that these will be the songs on the next record: Dream Baby Dream, High Hopes, Harry's Place, Heavens Wall, This is Your Sword, Just Like Fire Would, American Skin (41 Shots), Hunter of Invisible Game, Frankie Fell in Love, Down in the Hole, The Ghost of Tom Joad (Electric version), The Wall. Stay tuned for the latest and look for the official announcement to come as early as Monday! 11/22/13: A new rumor has surfaced that has come from members of Bruce's crew. Apparently some were told that there are no plans, as of now, for any US tour and most likely there will be no work after the summer. Interesting as North American date rumors have been flying around recently. Only time will tell. 11/21/13: Heard recently that a Bruce US tour would start in June. Source seemed fairly confident. Also, today ironically there were some dates thrown around on the internet. These dates have not yet been confirmed or denied by Bruce Springsteen. But, the dates listed below match the June time frame that I was told. 11/20/13: New rumor suggesting that the "new album" will consist of 13 tracks. Also rumored is that the single High Hopes will be track number three on the new album. This would most likely mean that this would not be a Tracks 2 type of release. It will most likely be a "new original album." Hopefully we get more information on Monday! 11/19/13: A new rumor suggests that Bruce may play Quebec City next summer. Apparently the "Plains of Abraham" festival has made Bruce an offer to play in June. Hopefully we will get some new dates with a new album announcement. 11/18/13: Now that we have an official High Hopes single release date, there were two very juicy rumors that surfaced today. One apparently was saying that Sony in France confirmed a new Bruce album would be out in January. The second rumor suggests that the release in January may be along the lines of a Tracks 2 release (a series of outtakes). Things are for sure heating up in Bruce's camp! 11/17/13: Ok, so now MusicBox is also showing the same song and album cover as we posted yesterday. Looks like it says the song will be available for download on November 25. This could mean that Bruce will announce the single and possibly the entire album on Tuesday (11/19) with the single releasing on 11/25. Either way, be sure to check back Tuesday for possibly exciting news! 11/16/13: Get ready for the biggest rumor so far on the upcoming new album. A leaked photo has shown a new cover art of Bruce Springsteen with the words "High Hopes" on the cover. Bruce was rumored to have recorded this song while he was in Australia earlier this year. According to the site in which it was leaked, the song "High Hopes" is 4 minutes and 56 seconds long and will also debut on November 19! It also says that the album will "launch" on November 25. This is a translation of what the site says: "This album has not launched yet. The album will be launched on 25.11.2013" I would take this as saying that Bruce will announce the album on November 25. Take a look at the picture below of the site and the cover art! Things are for sure heating up!!! 10/30/13: New rumor that a promoter in Europe said that Bruce will no longer be going to this specific country anymore in 2014. This does not mean that there will be no European tour but apparently there was a plan in place but they have fell through for this specific location. No word on the country involved. Keep it here for any of the latest rumors on the 2014 tour and album! 10/27/13: Hearing that the new Springsteen album, that is rumored to be out in January, is a solo type album. I thought for sure it would be an E Street Band album but a recent rumor suggests otherwise. Hopefully we know more soon! 10/27/13: Hearing from @GreasyLake that Springsteen will play in Johannesburg, South Africa on February 1, 2014. Tickets will supposedly go on sale this Wednesday. I would look for an announcement tomorrow. I have also heard rumors of January dates in South Africa. Hopefully we know for sure tomorrow. 10/20/2013: The new Springsteen album rumors keep flying around. Apparently now, the album is set and ready to be released in January 2014 with Europe tour starting in the spring. 10/19/13: A new Springsteen album is reportedly done. According to my personal sources, Bruce Springsteen has already finished up his new album. Hopefully we get more information in the upcoming weeks! 10/16/13: In a new interview, Steve Van Zandt stated that the February/March shows are "the end of the Wrecking Ball tour." Interesting to say the least. He did however say that the fans would know before he even knew which was kind of funny and amusing. I still think however that there will be a new album and a new tour in 2014. Bruce has already thanked the fans for a great tour and I don't think he will play those shows and then just call it quits. The stars do not align with Little Steven's quote. Bruce is working on a new album, rumors are out for additional 2014 shows and new album, Springsteen has yet to claim what tour the February/March shows will be. 10/15/13: Several rumors surfaced today. Apparently Springsteen had South Africa shows planned for 2013 but they fell through. 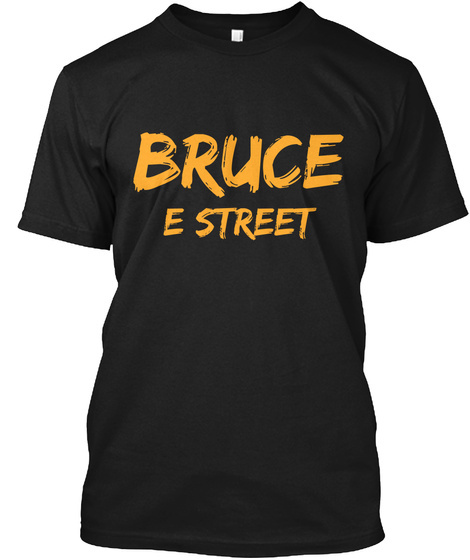 A new rumor today suggests that Bruce and E Street will hit South Africa in March of 2014. I'll let the picture below tell the story. There was also a rumor of Bruce playing at the Mirande country festival in France of July 2014. Interesting to know if that is with the E Street Band, which we would think it would be. Of course it may not be true at all, but thought I would mention it. Also read today that Springsteen may be in negotiations right now for a summer tour of Europe. Stay tuned for the latest! 09/29/13: A new rumor surfaced on a fan forum today. The person claims that Bruce is negotiating some shows for over in England in December 2014. He/she has heard that there are two shows booked for the London O2 Arena. Leeds is also rumored to happen in the same month with them saying "negotiations are also at an advanced stage for a return to Leeds First Direct arena in the same month." As always, take this with a grain of salt but I can for sure see this happening. 09/10/13: Some whispers that Springsteen may take a trip to do some shows down in Africa next March shortly after the New Zealand shows. This could work as the Australian/New Zealand promoter said that there were some constraints to adding more shows after the early March New Zealand shows. Stay tuned for more information if it comes up! 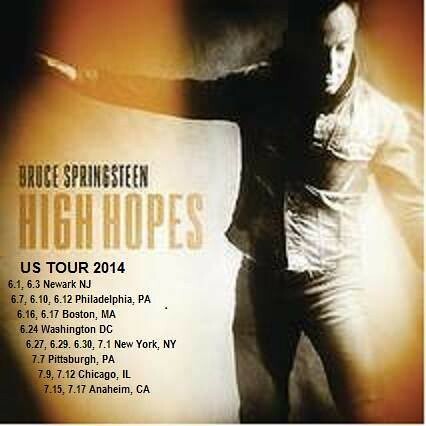 09/07/13: Someone posted on a fan forum today that Springsteen may tour the US in March of next year. This could and would make sense as the New Zealand tour wraps up on March 2nd and there is nothing planned afterwards. 09/04/13: Take this one with a grain of salt just like any other rumor but...someone posted that Bruce may play some New Year's shows down in Miami. Don't forget that Live Nation did post that picture showing a 12/31/13 date for Los Angeles but it was most likely just for testing the site. The person wrote that there has been talk all over South Florida about this. Would be nice to see, but not thinking so. 08/25/13: Heard today that Michelle Moore told a friend that the band held some sort of rehearsal last week. Possibly rehearsing some special things to put out in South America. 08/22/13: An Australian promoter has said that it is possible that Springsteen will add a second Perth show. He said that it will all depend on demand. You can clearly see that Bruce has several more holds on dates in Australia pending their ticket sales as he has some gaps in between dates. I fully expect additional dates for Australia to be announced. 08/18/13: Saw on a forum a few days ago that Springsteen may be in talks again with Halifax and St. John's. It was rumored that he was going to hit St. John's this month but of course that did not happen. A article was released a few weeks ago that stated that it fell through because they could not find a big enough venue/place to hold the concert. Apparently they are back in talks to find somewhere to hold the show next summer in 2014. Take it with a grain of salt but I do believe that there will be some sort of North American shows next year. 08/14/13: Now hearing about 2-3 hours later that an announcement could even come tomorrow August 15. Auckland is now also rumored for March 1 and ads for the show will start tomorrow. This can mean that an official announcement could very well come tomorrow. Everything is lined up, now we wait until tomorrow. 08/14/13: Australia rumors are apparently what everyone wants to talk about. Very interesting developments today on the internet. Seven possible dates have been leaked for Australia shows starting February 7 in Perth. The site gave pre-sale dates that could start as early as next week (August 21). This seems unlikely but the site seemed to be legit. People have said that they have provided false rumors in the past but nothing ever with on sale information. The site was also advertising that they will give a pair of tickets away to one of the February Australia shows. This could mean that we could have an announcement this week about a new album and a new tour for early 2014. Will be interesting and I will be sitting on pins and needles for the next week! Check out the News page for a picture. 08/10/13: Heard this from a source about two weeks ago and confirmed with them again that there will not be any early 2014 Australian shows. I heard that March shows were in the picture but it doesn't look likely now. This does not mean that there will be no shows, just not as early as people are thinking. 08/05/13: Read that an Australian news station sent a reporter out to the final European Kilkenny shows and did some interviews with some fans. Could they have also interviewed Bruce and/or other members of the band? Could be getting an interview for a new tour in Australia. I don't think they would physically send someone over to a European show if there wasn't a reason. You never know these days! 08/05/13: This rumor has been floating around and I realized I haven't posted it yet, sorry! There are talks going around that Bruce and the band will hit Australia sometime early next year. Possibly in March and April. This does line up with a European tour following right after. Also heard a possible December time frame for the band to hit Australia but I'm doubtful on that. Probably will happen March/April if it happens at all. 08/04/13: Heard rumor that Jon Landua (Bruce's Manager) met with European promoters for a possible new tour in Europe starting around April of next year. 07/19/13: Read today that Springsteen is expected to make some sort of announcement about the 2013 Wrecking Ball tour next week! My money is on a few additional South American tour dates before the Rock in Rio show with the ever so slight possibility of a Northeast US tour in October. Check back here next week, of course if there is any sort of official announcement, it will be on the News Updates page. 07/18/13: A new rumor suggests that Springsteen tickets for Chile will go on sale next week! Expect announcement possibly tomorrow or early next week if true! 07/09/13: Just read a very intriguing rumor but take it with a grain of salt. Apparently someone was told that Bruce will play Central Park in New York City this September. This would for sure be interesting. The same person wrote that three additional dates were definitely added which would take place after the European tour and before Rock in Rio. I'm thinking that those three dates will be in South America but I'll take the Central Park rumor! 07/06/13: Gary W. Tallent (@gwtallent) tweeted this statement today: "People ask about U.S. dates and all I can say is that it looks like there is not anything on the horizon 4 now." Looks like the band will take a break and come back in 2014 with the new album. 07/05/13: A local paper wrote an article stating that Springsteen and the band are coming to Santiago, Chile on Spetember 12 and the band will also hit Argentina in September. Not confirmed, but looking very bright for South America. With this, I would expect an announcement this week or next week. 07/02/13: I e-mailed the charity that was auctioning off the "4 U.S. fall tickets" asking if the tour would continue in the U.S. and just got this response: "This tour will commence in the U.S. Should you have any other questions or concerns, please do no hesitate to reach out." Conflicting reports now, that there will be and won't be a U.S. tour. 07/02/13: A reader sent in an e-mail stating that they have a pretty reliable source and that there will be no U.S. tour dates in 2013, South America only. 06/27/13: Buzzwire.com shows a new date for Bruce in September. Apparently on September 27, 2013 Bruce and the band will play Buenos Aires, Aregntina! This of course is not confirmed yet. 06/27/13: A new post suggested that Bruce and E Street will play the Wells Fargo Center in Philadelphia in October! Don't give up hope yet! 06/24/13: Someone on BTX posted that they have a close source with Gillette Stadium in the Boston area. The person who posted on BTX said that the source texted them Friday telling them that Springsteen and the band will play at Gillette Stadium in September. 06/21/13: New rumor has suggested that Bruce will do a South American tour before the Rock in Rio date. Apparent cities include Buenos Aires and Santiago, Chile. South America rumors are starting to heat up. I personally think though that Bruce would have to announce these very quickly if true, they would need more time to sell tickets in South America. 06/18/13: A new rumor has come forward and hopefully is true. Someone posted that there will be an announcement by the end of June to announce about 30 North American shows that will run from August through November. The person who posted this said that there source is "very reliable" and has even spoken with Bruce and members of the band. If this rumor is true, we are less than two weeks away from seeing, the unicorn like, North American dates! Keep those fingers crossed! 06/14/13: New rumor has surfaced that the band will play Stadium shows in the North East in late August and that an announcement is coming soon. 06/11/13: Blogness on the Edge of Town, another popular Springsteen blog, has posted an article titled the rumor mill. They state that they have heard all of these rumors from fairly reliable sources in the past few days alone. Keep it here for all the latest rumors about the buzzing North American 2013 tour! 06/10/13: Another Fall U.S. rumor has surfaced that Bruce and E Street will play in Orlando this fall. The source is apparently a high ranking official inside the Magic basketball organization. 06/06/13: Bruce has reportedly hit the studio back in March of this year in Australia. Bruce has also said recently that he wants to do a Seeger Sessions type of style next after this E Street Band tour. Looks like that is what is next on Bruce's agenda. A new Seeger Sessions album and tour. 05/15/13: Atlantic Canada Rocks is a site that is "The East Coast's Concert Authority - Concert News, Speculation, and Discussion" according to their twitter page. Speaking of their twitter page, they just tweeted out a very interesting tweet regarding E Street. "ST. JOHNS! St. JOHNS! Are you ready? Can you handle the mighty power of the E STREET BAND?" With all the rumors coming in all at once, it is safe to say that an announcement is probably about to drop soon. 05/15/13: Another juicy rumor found a forum. Someone posted that he is good friends with one of Bruce's main security guards and the man told him that there will indeed be a North American tour that will start in September. This source has been correct 100% of the time the poster writes and that the tour will make stops in Toronto and Montreal. An announcement was also pinned in the the next few weeks. Rumors are flying all over the place and that only means one thing...an announcement as the source noted is close, very close. 05/14/13: BTX has been stirring up rumors for months now about a possible U.S. tour in 2013. A new rumor has surfaced on the popular forum saying that the band will play in Sunrise, FL sometime around November. The source says that he/she has a friend who is a ticket broker and is telling their suite clients that Bruce will be performing there this fall. The source goes on to say that they usually do not do this unless they know that the performer is a lock and will be playing there. So, more good news for a US tour and it is matching up with the rumors of holds going around. 05/06/13: How close could we be to finding out if there will be a US tour? Probably very close. I have had someone tweet me, who is a very reliable source, telling me I should not worry about there not being a US tour. Someone else on BTX explained that a very close friend of his explained that the arena he worked at contacted Bruce and Bruce's camp replied that they are already all booked (this arena was in South West Ohio). Another person on the same topic posted "It's happening. Multiple dates on hold. Fairly extensive." So, it looks like we will indeed be getting shows in North America as the rumors keep getting louder and louder as we head towards summer. Now will it be stadium shows or arena shows? Maybe both? Look for an announcement soon as we thought an announcement would be made last month. 04/07/13: Picked up a rumor on a Springsteen Forum in which a person says that Springsteen will play Halifax, Canada on September 17, 2013. Which could very well be true. It is expected that Bruce and the band will have a U.S. stadium leg this summer. Stay tuned for an announcement, which we think will happen this month. 02/26/13: Live Nation may have just leaked the first U.S. 2013 tour date! It was leaked that Bruce Springsteen and The E Street Band will play in Los Angeles, CA on December 31, 2013! Full news story on this (including picture!) can be found in the News Updates section! 02/23/13: A new, very juicy rumor has surfaced on BTX. Apparently someone from Madison Square Garden Management was blocked from taking a vacation in September as Bruce Springsteen and The E Street Band were booked for a 10 night stand from September 21 to October 9! I would take this one with a grain of salt but would certainly be nice to see! 02/11/13: Forgot to post this rumor when I first heard about it, sorry! Better late than never! In a recent Grammy interview Bruce released that he has worked on a country album that is completely his own. That's right, no Seger Sessions this time around. This has for sure intrigued my interest on what this could sound like. Did he write most of these for the Wrecking Ball album? Lots of questions that I have thought about. I, for one, would prefer the rocking E Street Band album that you can blare down your local Main Street. I don't see this country project making the light of day for at least a few more years. Thought it was interesting to say the least though! 01/28/13: There are multiple rumors going around that another Ireland date will soon be added! The event would take place at Nowlan Park in Kilkenny, Ireland. The rumored date is either July 26 or July 27 which would/could be close to the end of the European tour. Official announcement from Bruce's website is expected to be this Thursday, January 31! Keep it here for the latest on this show possibility. 12/01/12: Heard today that Bruce has the Asbury Park Convention Hall blocked out for 2 weeks. This is coming apparently from a "very reliable source that works for the town of Asbury Park..." Could we be seeing some E Street Holiday shows or will they just be rehearsing for a possible early 2013 US tour? Keep it here for the latest news! 11/26/12: Hearing that European 2013 tour dates will be announced within the next 24 hours. Keep it here for the latest. One person citing that Paris in June 2013 is almost certain. 09/09/12: More rumors going around that Bruce and the band will continue their tour into 2013 (with or without a new album). The new rumors shine light on places like Japan and Australia. The band would then return to Europe early next summer and then come back home to the U.S. and close it out! Also a rumor of Mexico City getting a show in December. Keep it here for any new rumors or dare I say...concert announcements! 07/16/12: Yet another ticketmaster leak for a fall date. The date was listed as October 21, 2012 in Hamilton, Ontario. The date was quickly pulled from the website however it was listed that they would go on sale this Friday just like The Penn State show that was leaked and then pulled. Announcement has to be coming up very very soon if these are true. 07/13/12: Ready for the biggest fall tour rumor yet! It seems as if Bruce INC. may be gearing up to release the 2012 fall tour dates! Today, ticketmaster.com released/leaked information on an upcoming Bruce concert on Novemeber 1, 2012! That's right. The band is suppose to play the Bryce Jordan Center in University Park, PA which is Penn State. This makes sense as Pittsburgh shows have been rumored for the late October time frame. On ticketmaster it reads that the tickets for this November show go on sale next Friday: July 20. Could this mean a release of fall dates very shortly!? 07/05/12: New rumor has surfaced that the band will do an Australian tour in March 2013. 07/02/12: Another new Springsteen album in the works? That seems to be the latest word on the street. Tom Morello tweeted on June 29th that he recorded with a rock icon's new upcoming album. Could this be Bruce? It is rumored that Bruce will most likely take a few weeks off after the September shows to put finishing touches on the new album. 06/15/12: A list of cities have "leaked" their way out according to one source. The cities that could possibly be getting some fall shows would be: Seattle, Vancouver, Portland, Oakland, Las Vegas, San Diego, Anaheim, Phoneix, Denver, Pittsburgh, Columbus, Rochester, Montreal, St. Paul, Des Moines, Kansas City, Dallas, Houston, Oklahoma City, St. Louis, and Milwaukee! 06/10/12: Columbus, OH is now in the rumor mill for a ledendary E Street Band show. Lots of rumors are building up...announcement soon? Probably not, I would guess sometime in late July to August. 06/08/12: According to a Ottawa radio station, Bruce and E Street are making a stop in Ottawa "later this year." The radio station says: "Our VERY reliable spies tell us we should prepare for a visit later this year!" Stay tuned...looks like there will be more dates through the fall in North America! 05/08/12: A new rumor has surfaced that Bruce may play Fenway Park after all! A new source claims that Bruce and the band may play the week prior to the Gillette Stadium gig on August 11th! This has not yet been confirmed by Bruce Springsteen. 05/07/12: Well...yesterday I posted about some rumors going around about what the band will do after the stadium leg in the summer...a new source has claimed that they have a specific date for a new show! The date is 10/28/12 and the show will apparently be in Pittsburgh, PA! There was no word on a venue but most likely it will be at the Consol Energy Center...also a Ft. Lauderdale, FL rumor has popped up. This source was very confident in the Pittsburgh date, so hopefully we will get an announcment soon! 05/06/12: There is a lot of speculation of when the tour will end. Will it end after the stadiums shows or will it continue on into secondary markets where Bruce and the band didn't hit? The most popular rumor seems to be that the band will tour through 2013 and hit those secondary markets and then swing back to places like New York and Philly to end. Keeping those fingers crossed because this tour is amazing! 03/30/12: As if we didn't already know about another U.S. leg...Bruce ended last night's show in Philadelphia by yelling: "We'll be back!" Suggesting at future dates after the European leg. 03/27/12: Didn't get tickets to see Springsteen in Boston? Have no fear, a new report came out today suggesting that Springsteen will not play Fenway Park but he will play Gillette Stadium on August 18, 2012. The band has not announced any summer U.S. tour dates but they should come a little after the first leg. Multiple "reports" have been coming in from Chicago to New York to Boston. Stay tuned! 02/29/12: Another rumor has come out saying that the E Street Band tour will be 18 months long. Who is really suppose to know though? 02/11/12: A Boston newspaper apparently has some insight on some Summer dates for Bruce and the band in August. According to the source, Bruce Springsteen and The E Street Band will play Fenway Park in Boston on August 11 and 12. There is also a Chicago date floating around (Wrigley Field, September 8, 2012). 02/05/12: Report says that Bruce Springsteen and The E Street Band are rehearsing today in private in Asbury Park, NJ at the Convention Hall. Most likely preparing for the Grammy's which are next Sunday! Report also says that he will be rehearsing between 1-5 PM. UPDATE: No Springsteen rehearsals at Asbury Park today, looks like to be just rumor. 02/02/12: A source that I have has said that the 2nd leg of the US tour will kick off at the end of August. This same source claimed that the US first leg would kick off at the time it did. So for some reason, this source seems to be for real, considering everyone else thought early March and kick off in Denver. Will update if he feeds me anymore information! 02/01/12: Steve Van Zandt, a guitar and back up vocal player for the band was on a radio show a day or two ago and said that he thinks that the band will be on tour from anywhere from 12-18 months. Also another band member, Nils, said that the band will have a saxaphone player on their upcoming tour.